The worker has enhanced this wonderfully vigorous, scrolling design with dragon heads by a careful use of colour. Taking just one stitch, he or she has embroidered the heads in yellow, green and blue silk in sequence and added red outlines, almond-shaped eyes and protruding tongues. A search for dragons produced several possibilities; the first was those which featured on the silk lining of the 'coronation mantle' of Roger Il of Sicily. They do not bear a close resemblance to the embroidered ones; a more comparable representation is a dragon head within a scroll painted on the ceiling of the Capella Palatina in Palermo. 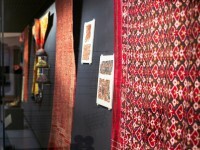 Both the silk and the paintings are ascribed to Muslim craftsmen so perhaps the embroidery could have come from Sicily. Another possibility is that these are Seljuk dragons, for similar motifs can be seen decorating buildings in Konya, Anatolia and Aleppo, Syria. The latter seems more likely because part of a 13th century Seljuk silk preserved in the shrine of Saint Apollinaris, in the church of Saint Servatius in Sieburg (Germany), has dragon heads within scrolls as part of its design. The drawing is more elegant but the dragons also have almond-shaped eyes, pointed ears and protruding tongues. A brown tendril with red outlines has yellow, green, and blue leaves emerging from it which look like dragon heads. The heads are also embroidered with a red outline. The continuous tendril is set into an undulating outline, also brown with red lines. The uncalibrated radiocarbon date for the textile is 985 AD +/- 36, but the calibrated result of 980 to 1160 pushes the date towards the end of the range.